Already towards the end of the second century, St Irenaeus of Lyon identified the four animals (or “living beings”) seen by Ezechiel in the vision at the beginning of his book as prophetic symbols of the four Evangelists. 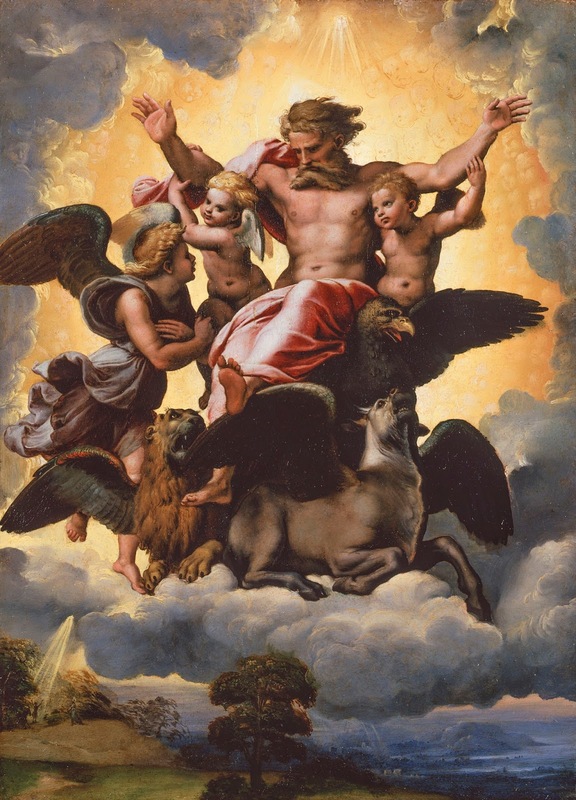 These are a man, a lion, an ox and an eagle, the same four which later appear to St John in Apocalypse 4. This tradition was followed by Ss Augustine, Jerome, and Gregory the Great, although they differ from Irenaeus as to which animal symbolizes which Evangelist. (Jerome’s explanation, confirmed by Gregory, eventually prevailed.) They all agree, however, that the ox, an animal commonly used in temple sacrifices in the ancient world, including those of the Jews, is the symbol of St Luke, who begins his Gospel with the story of St John the Baptist’s father, the priest Zachariah. This interpretation is also strongly suggested by Ezechiel’s words, “the face of a man, and the face of a lion on the right side of all the four: and the face of an ox, on the left side of all the four: and the face of an eagle over all the four.” (1, 10) The man and the lion, who represent Matthew and Mark respectively, are both on the right, since their Gospels are very similar to each other; Luke records many stories that are not in the other two Synoptics or John, hence the ox which represents him is on the left; while John says the most about the divinity of Christ, and hence his eagle is placed above the others. The traditional Gospel of St Luke’s feast is taken from his tenth chapter, verses 1-9, Christ’s instructions to the seventy-two whom He sent out in pairs to preach “in every city and place where He himself was to come.” It is also read on St Mark’s day, and was later extended to the feasts of various Confessors. The revised liturgies which held sway in most of France from the mid-17th to the later 19th centuries, (now often called “Neo-Gallican,”) contain a great many lapses in taste and judgment which almost beggar belief. 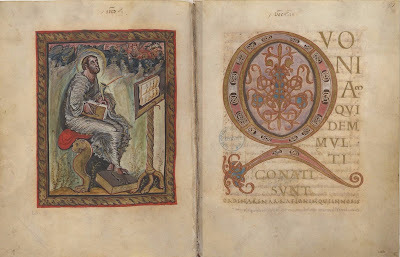 Like most people who put their hand to changing historical liturgies, the Neo-Gallican revisers were painfully obsessed with making everything “more Scriptural,” but in the process of expanding the Missal’s corpus of readings, they did manage to make a number of rather clever choices. One of these was to read St Luke’s prologue as the Gospel on his feast, as in the 1738 Parisian Missal. In the original Greek, this passage is written in a notably higher style than the rest of the Gospel, perhaps a signal that the author is indeed a man of education, and hence suitable to the writing of such an important work. It is likely that he received his education while training as a doctor in his native city of Antioch, one of the most important cities in the Eastern Mediterranean at the time, which he mentions several times in the Acts. 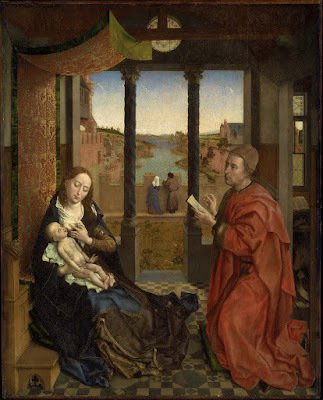 A tradition attested since the sixth century states that St Luke once (or more than once) painted an image of the Virgin Mary, for which he has long been honored as a patron Saint of artists as well as doctors. This tradition may have arisen as a metaphorical way of describing the “portrait” of the Virgin which he gives in his Infancy Narrative; the first two chapters of his Gospel recount the events of Christ’s conception and birth from Her point of view, as it were, where St Matthew speaks more about St Joseph’s role. It is also he who records most of the actual words spoken by the Virgin, far more than the other three combined. However the story arose, there are a number of ancient icons which are said to be the original painted by St Luke himself, or a faithful early copy thereof, and “St Luke Painting the Virgin and Child” has been a popular subject for artists in both East and West. On the other hand, the Byzantine Office makes only one glancing reference to this tradition, in the following text from Matins. Luke, apostle of Christ, revealer of ineffable things, and teacher of the nations, with the divine Paul, and the holy Mother of God, about whose divine image thou didst inquire, pray for us who bless thee, and honor thy holy falling-asleep, o beholder of God, and all-wise revealer of the divine mysteries. The vagueness of “about whose divine image thou didst inquire” is significant, because the Canon with which this is sung was written by one Theophanes, who, together with his brother Theodore, is honored as a Saint for his defense of the holy images in the days of the iconoclast heresy. (They are called “the written-upon ones”, since the iconoclast emperor Theophilus had lines of verse cut into their skin.) Arguments from silence vary in force according to circumstance. However, it seems likely that if the tradition that St Luke made an image of the Virgin rested on a solid historical foundation, a defender of the holy icons would make much of that fact when writing a Canon in honor of him. The Byzantine Office also refers explicitly to an Eastern tradition that St Luke was one of the two disciples who met Christ on the way to Emmaus, the one not named in the Gospel itself. This would be in accord with the common ancient practice of authorial anonymity; for the same reason, it was sometimes supposed that St Mark was the anonymous follower of Christ who escaped arrest in the garden of Gethsemani by running out of his clothes, an episode which is mentioned only in his Gospel. (14, 51-52) However, this story was completely unknown in the West; St Ambrose, for example, says that Cleophas’ companion was called Ammonas. From thy writings we know, as thou said, the verity of the words which thou set forth and revealed under divine inspiration; since thou didst put thy hand to write for us of the matters of which thou were fully informed, and as the eye-witnesses handed on to thee. And thou becamest their equal, and a servant of the incarnation of the Word, whom thou didst see at Emmaus after the Resurrection; and with burning heart, thou ate together with Cleophas. Fill also our souls with His divine fervor as we honor thee. Another text from Vespers admirably sums up the whole career of St Luke as follows. Rejoice, thou who alone in joy did write for us “Rejoice!” (Χαῖρε, Ave), the Gospel of the Holy (Virgin), and of her giving birth to the Lord, of the Baptist speaking from the womb, of his conception, and the Incarnation of the Word, His temptations and miracles, His discourses and sufferings, the Cross and Death, and the Resurrection, which thou saw, and the Ascension, and the descent of the Spirit, and the deeds of the heralds, especially of Paul, whose companion thou wert, healer, revealer of the mysteries, and enlightener of the Church, which do thou ever guard!